Chief Minister Pema Khandu today welcomed the merger of Congress party workers of 16th Yachuli Assembly Constituency to BJP party here in presence of State BJP President Tapir Gao, Parliamentary Secretaries Likha Saaya, Tamar Murtem and Tage Taki. The Congress workers who joined the BJP party include Zila Parishad Members from Yazali, Yachuli and Pistana Anchal Samiti Block along with their respective Anchal Chairpersons. It also include 26 panchayat members consisting of ASMs and GPMs from Yazali Zila, 50 members from Yachuli Zila and 33 members from Pistana Zilla. The Chief Minister also welcomed the joining of members from Block Youth Congress Committee and Block Seva Dal Congress Committee to the BJP party en-bloc. 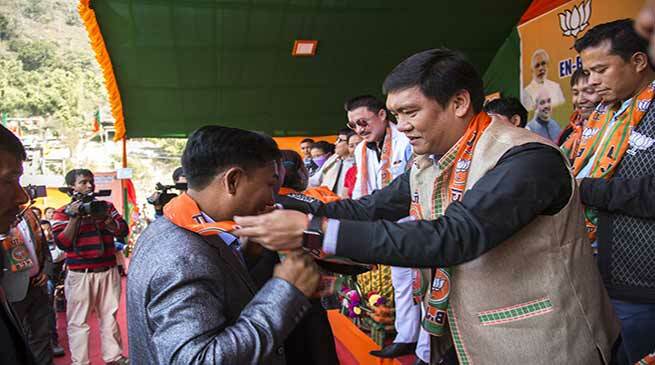 Terming the day as historic, Khandu applauded the Yachuli constituency for becoming ‘Congress mukt’. He appreciated the move of the newly joined members saying that it was a wise decision taken in the interest of the development of the constituency. He said once you have come into the BJP party fold there is no difference between newcomer and the old party members. We are all in the party as team members, he said. He said the motto of the party is ‘Sabka Saath, Sabka Vikas’ (Collective Efforts, Inclusive Growth) with the guiding principles of ‘Antyodaya’ means ‘rise of the last person’ and ‘Sarvodaya’ or ‘the rise of all’. He said Prime Minister Narendra Modi is very much concerned about the development of Northeast, particularly Arunachal. He informed that PM’s visit is scheduled on February 15next where Modi will address the developmental issues of the state. The Chief Minister said the BJP government in the state is completely focused in bringing transparency, corruption control and employment generation. He said under BJP, the state government has achieved its 90% of work and solved many pending issues inherited from the previous governments. Responding to the key issue of infrastructure development in Yachuli for efficient functioning of Divisional Commissioner’s Office, the Chief Minister said it is now the responsibility of the state government to develop the new headquarters it will serve all the Western districts. He assured to reflect it in the budget announcements. He informed that state government has decided to accord 1% free power share for local area development from the revenue generated from 405MW Ranganadi Hydro power projects. The Chief Minister appreciated the visionary step by Yazali people who had welcomed building of a dam in their area, which is now meeting the power requirements of state capital and various districts in Arunachal. He, however, said he welcomes such development, which is nature friendly. Various dignitaries that include Tapir Gao, Likha Saaya, Tamar Murtem and Tage Taki also spoke on the occasion.